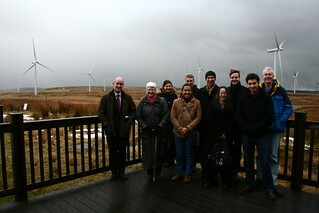 The day after the 5th International Conference on Carbon Accounting some 20 of the attendees joined us on a chilly and windy trip to the largest wind farm in Europe, at Whitelees in East Renfrewshire. ICARB at Scottish Power’s Whitelees Wind-farm. Photo by Ric Lander (cc). Our host was Gordon McGreggor of Scottish Power and he very kindly arranged for us to be informed about the history and the workings of the site by those who manage it and the Scottish Power energy grid in talks at the visitor centre. Walter Watson also explained how the technologies work in relation to the fauna and flora of the site, pointing our 5000 year old Bog Oak branches on our tour of the site. We were able to discuss some of the finer points of how the grid operates and is accounted for and they were also interested to learn a little from Garvin on the handling of such issues in the USA. Martin Mathers, the onshore policy manager for Scottish Power also discussed carbon accounting of Scottish Power assets and was interested to hear from ICARB members on whether their deployed carbon calculator was suitable. They were extremely hospitable and even provided very welcome hot soup and sandwiches along with their fascinating descriptions of wind generation in the region that is now more than self-sufficient in renewable generated energy. This entry was posted in Carbon News, Top news on April 5, 2013 by Ric.